Sawdust Pudding. Doesn't sound very appealing, does it? 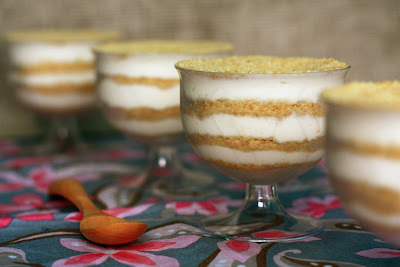 Serradura is actually a layered chilled dessert made up of a sweetened, vanilla whipped cream and crushed biscuits. 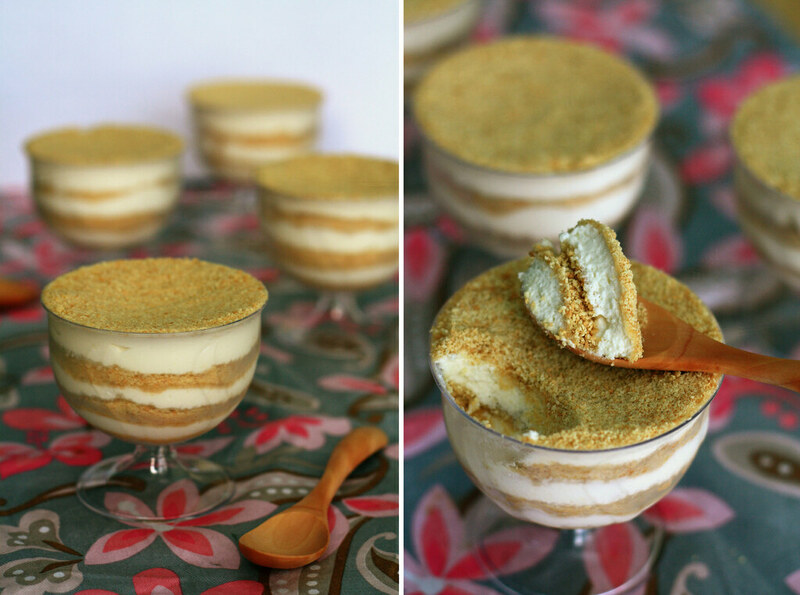 The creamy layer is a perfect match with the slightly rough biscuits. 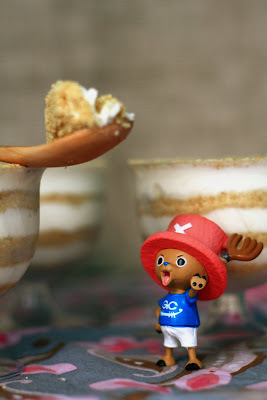 Recently, I found a cafe that replicated this dessert and did it justice. Well, it was even better than the Serraduras in Macau. (The other ones I've tried before are just no match - the cream not flavoured enough, too sweet, tastes like raw cream, wrong type of biscuits used...) Remembering that I've once seen a recipe for this before, I decided to re-create it in my kitchen. As a first attempt, it wasn't bad, but I just couldn't replicate the exact flavour. Still investigating as to what the magic ingredient is. Vanilla seeds, maybe? 2. Whip whipping cream to soft peaks. Add vanilla essence and condensed milk (Suggests you add 2/3 first, taste, then add more if it needs sweetening). Continue whipping until stiff peaks. 5. Chill in the freezer for two hours. When serving, leave it out for a bit (around 10 minutes) for it to soften. They look yummy and very neatly presented. Keep it up gal! Such a pretty presentation! Yum! Yep, no butter needed for this one! does it need to be placed in the freezer for 2 hours or can it be placed in the fridge instead? If it is placed in the freezer, the product will have a harder texture (sort of like ice cream) but if it is placed in the fridge it will stay soft. I personally prefer placing it in the freezer. excellent post and pictures! i'm going to try making a vegan version! How many cups did you made with the the ingredients you provide? Also how many people can you serve using this ingredient? I'm sorry that I don't remember exactly since this was long ago...but maybe around 4 cups/servings. The recipe is easily doubled and I'm sure your guests won't mind having seconds if you have extra! Thanks :) I enjoyed the read! I chanced in your blog while looking up Serradura. As a writer by profession, I just want to say how impressed I am by the quality of writing by a 17 year old - some if the writers I deal with should die of shame !! Keep up the good work. Hi Wendy, I loved your blog! Congratulations! After reading your "serradura" recipe, I was left wondering if it is the proportions you should correct. 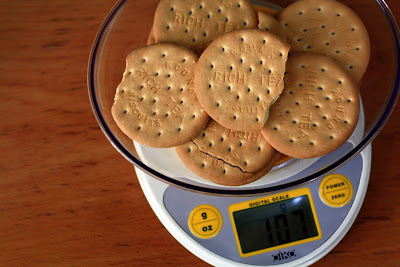 After checking my recipe book, I confirmed that for 100g biscuits I would use 100ml of condensed milk and no vanilla extract. This is a very common recipe in my home country (Portugal) but I don't know if in Asia it has the same exact flavour. Anyway, I hope I was helpful. Hi Wendy I tried making it it was really good and fun !!! So thanks you were the only website that had the real recipe !! Love your presentation! Adding gelatin to half way through whipping gives a different texture to the pudding.